The success of your irrigation system depends largely on the contractor you choose to design and install it. A contractor's expertise and skills will affect your system's efficiency and reliability. In fact, how your irrigation system is designed and installed will make the difference between a system that continues to keep your lawn healthy and green, and one that creates problems by wasting water and leaving your lawn unhealthy and brown. An efficient, well-organized contractor will be happy to provide you with all the information you need to make an informed choice. First, the contractor will want to view your property in order to determine soil conditions, water sources and pressure, and planting materials. He will then present a formal estimate detailing what he plans to do and the total price for design, materials, and installation. Along with the estimate, the contractor should clearly explain all the project specifics. What type of product will be used and why? A professional should tell you what type of controller, valves, rotors, or spray heads are best for your landscape. Is after-sale service provided? A professional should be willing and able to provide after-sale service. Is there a system warranty? A professionals work should be guaranteed  a one-year warranty is typical. Does he have references available? A professional should be willing to provide you with the names and telephone numbers of satisfied customers, so you can call and check his references. When choosing a contractor, you should be wary of those who offer to charge you significantly less than others. Low bidders may not be licensed or insured and may often use cost-cutting techniques that can jeopardize your lawn and shorten the life of your system. Not including a backflow preventer: This is required by local codes to protect your drinking water. Installing a cheap backflow or connecting the backflow with PVC pipe instead of copper pipe installed by a licensed plumber: This leads to breakage problems which are very costly to repair and can also lead to basement flooding, which would not be covered by insurance due to non licensed installation. Installing sprinklers too far apart: This makes it impossible for certain areas to receive enough water and can cause brown spots during the hot summer months. Not using special protective valve boxes: These components are necessary to safeguard the electrical elements, guard against short circuits and prevent corrosion. Using undersized supply lines or overloading the zones: This decreases the pressure and flow to the sprinkler heads which leads to poor pattern and an inefficient system. Not using protective conduit for wiring into your house: This leaves your wires exposed to animals and elements which can cause damage leading to short circuiting. Poor design and layout: This causes areas to be overwatered and/or under watered which leads to soggy and mossy areas in some parts of the yard while other parts are dry and burned out from lack of water. Using non-adjustable spray nozzles: This shortcut leads to overspraying into areas which you don't want watered and also not watering certain portions of areas which need water. Installing a poor controller: Cheap controllers are not user friendly and can be frustrating for the customer. 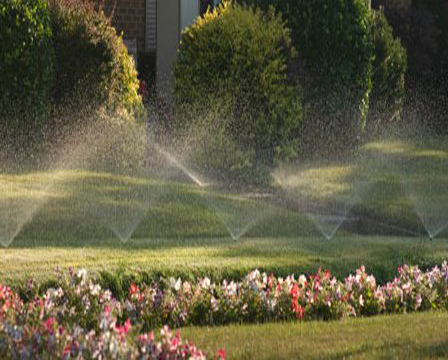 They also do not allow for precise watering programs, which leads to an inefficient system.